Have you ever wondered if online counselling could be suitable for you as an HSP? That’s a question I often get asked, which is why I’ve written this: the highly sensitive person’s guide to online counselling and therapy. As a highly sensitive person, you’re someone who generally likes to consider things in depth, looking at ideas from different angles, before you come to a decision. In this post, which is Part 1 of the highly sensitive person’s guide to online counselling, we’ll take a look at 9 advantages, and disadvantages, of online counselling from the point of view of someone who has the highly sensitive trait. And in Part 2 of the highly sensitive person’s guide to online counselling (coming soon), we’ll be taking a look at some questions you can ask yourself once you have started working with an online therapist. A quick explainer: Online counselling is also sometimes termed web-based therapy, virtual counselling, e-therapy, distance counselling, or teletherapy. It can be delivered via video (similar to Skype, although other platforms are normally used due to security concerns), instant chat (your online therapist can explain what this is, if you aren’t sure), phone (or VOIP which stands for ‘Voice Over Internet Provider’) or email. Therapy Online, or Face-to-Face: Which is right for you? I’m not trying to convince you either way; I’m hoping to offer you some starting points to help you think about whether or not online counselling could be a good option for you. I’m experienced (and trained) in working with Highly Sensitive clients both face-to-face (in Essex, UK) and also online, so I like to think I have a foot in both camps. There are lots of great things about online therapy, but it’s not a good fit for everyone. Here in the Highly Sensitive Person’s Guide to Online Counselling I’ve come up with a list of 9 advantages of web-based counselling, along with ways in which, on the other hand, it may not suit you, depending on your personal preferences and needs. Probably the biggest reason people choose to work with a therapist online instead of face-to-face, is that it can be so convenient. You don’t have to spend time, money and effort getting to your therapist’s consulting room. There’s no worrying about finding a parking space, or your bus being late. You can even have your counselling session in your lunch hour, and still have a few minutes to grab a sandwich and make a coffee. Many people find that the time they spend travelling to and from their therapist’s office is a much-needed ‘buffer’ time, an important part of their transition between different modes of being. If you’re a highly sensitive person, this may feel even more necessary. If you’re worried about colleagues or friends asking ‘where are you going?’, or spotting you walking in to a counselling centre, you may appreciate the way that you can access online therapy from the privacy of your own space. And occasionally a therapist’s consulting room is not as well soundproofed as it might be, leaving you with concerns about being overheard from outside when you are in the room with them. However in online video counselling, besides being alone in the room, the therapist generally uses earphones or a headset, so you’re not going to be overheard by anyone else (on their end, at least). Some people access online therapy via their mobile phones, after driving their car to a secluded spot and parking there during their session. (This is something to discuss with your online therapist, as there are a few factors to consider). If you live or work with other people, it may be hard to find a quiet place where you won’t be overheard or disturbed during your phone or video session. Accessing online counselling via text-based platforms might suit you better – or of course you may be best served by seeing a therapist face-to-face in their office. There may be all sorts of constraints that limit your options for finding a therapist. For example, you may require disabled access, a creche, someone based very near your workplace or home, or on your local bus route. You may have an anxiety disorder in which you are fearful of going out. Or you may have a preference for a therapist who has specific expertise in the problem you want help with, or who is trained in a particular type of therapy. If you live in a rural community, or are an expat living abroad, it might simply be impossible to find a local therapist who you don’t already have a social connection with. So an online therapist from outside your community could be ideal for you. Some highly sensitive people (especially if they’ve suffered trauma) feel emotionally safer when they are in the same physical space as their counsellor. You can pick up all sorts of cues based on body language, smell, sounds from outside the room, etc. And for some people it feels important to have a solid sense of where you both are in space: things like the dimensions of the room, orientation, and geographical location could really matter to you. It may not be possible to find a counsellor in your local area who is aware of the details of the HSP trait. Many HSP’s prefer to work with a therapist who is knowledgeable about the trait, partly because it can save time on lengthy explanations. An HSP-knowledgeable therapist can help you identify which of your attributes are a result of the trait. They’ll help you figure out how you can adapt your individual circumstances to live as an HSP with as much ease as possible. It’s not essential to find a therapist who specifically states that they understand HSP’s. Many therapists and counsellors already have the empathy, skills and understanding to be able to work well with highly sensitive people, even if they don’t know there is such a thing as the HSP trait. If one week or month is never the same as the next, and you’re working in different places on different days, you may really love the flexibility of being able to access therapy from wherever you may happen to be. And if your therapist charges for missed sessions, and you travel frequently, it’s nice to feel confident that you will be able to access your session every week. It can feel discombobulating to access therapy from here, there and everywhere. Some HSP’s prefer the grounding, dependable feeling of spending 50 minutes in their therapist’s office each week. So much so, that they would rather pay for a missed session that they cannot attend, than have to deal with trying to get themselves into a ‘therapy mindset’ in a hotel room or car park somewhere. It can be nice to know you can snuggle with your favourite cushions during your therapy session, in a warm space where you truly feel at home. You can have your favourite herbal tea beside you, and look out of the window at a reassuringly familiar view. If you’ve been talking at home in your online counselling session about traumatic material, you might feel that it ‘lingers’ more at home. This is one reason why it may be best not to use your bedroom for online counselling. Many highly sensitive people like the feeling that they can somehow ‘leave behind’ their most difficult feelings in their counsellor’s consulting room, for the therapist to hold, digest and contain until the following session. After a therapy session, many people can feel a sense of heightened sensitivity and emotional fragility. For a highly sensitive person, leaving a therapist’s consulting room and heading straight out into busy streets and general hustle and bustle, can feel quite overwhelming. And if you’ve just had an intense and emotional session, you might not feel ready to expose your tear-streaked face and puffy eyes to the passing public. So an online session in the private venue of your choosing (such as your home) could be ideal. Traffic can be a nightmare in bad weather, or when there’s been a road accident. With internet counselling that you can access from home or work, there’s no need to struggle through rain-soaked streets, or to drive through hazardous fog, spray or high winds. And you won’t miss out on a session due to snow or ice, or risk being late for your session because of roadworks, a broken-down bus or cancelled trains. Sometimes internet connections aren’t as good as they could be. Some HSP’s can find this so alarming that it affects their ability to feel they can rely emotionally on the therapist; they need to know that they can be heard without delays or gaps in transmission. Usually it’s possible to find a work-around (such as working via text, email, phone etc, or improving bandwidth) but of course that won’t suit everyone. Especially if they are working from home and don’t have to rely on a shared consulting room being available, many online therapists are able to have more flexibility in their schedules. This way, they can sometimes accommodate changes and alterations that you may need to make with regard to your session times and days. And online therapy delivered via email is the most flexible of all, because you and the therapist don’t have to worry about both having the exact same time slot open in your schedules. It’s fine to try out a couple of different online counsellors, to see how it feels. And then having chosen one, have a few sessions to get more of a feel for how things work between the two of you. You may not really know if online therapy could be a good fit for you, until you’ve tried it for a while. I hope that this article, Part 1 of The Highly Sensitive Person’s Guide to Online Counselling, has been useful in helping you consider whether online counselling might be right for you. 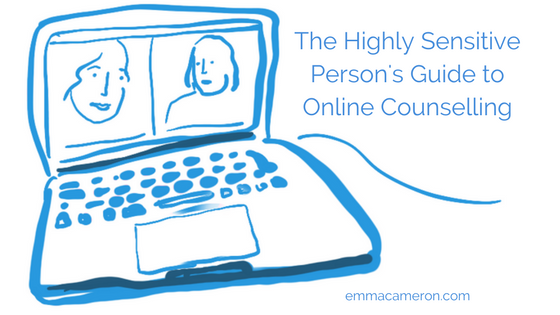 In Part 2 of The Highly Sensitive Person’s Guide to Online Counselling, I’ll offer some more things that you may like to consider once you’ve started working with an online therapist. Meanwhile, if you have experience of online counselling – whether as a client or as a therapist – what have I missed out? Please tell us in the comments below. Emma thank you for writing this, I hadn’t come across the term HSP, so doubly interesting to think about how ‘online therapy’ might potentially be helpful. I guess that ‘HSP’ helps, rather than to label, but more to validate or articulate experience and enable exploration of that within therapy; and working online, with a qualified ‘online’ therapist, can be particularly beneficial for some. I agree, descriptors such as ‘HSP’ are useful not in order to label, but to help ‘validate or articulate experience’ as you so beautifully put it. And to help someone to think through whether online therapy might (or might not) work well for them.